" The King of the Castle and the Roads ! " 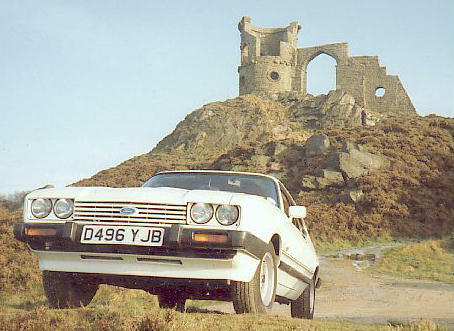 The largest web site dedicated to the Ford Capri Laser in the World! So the clocks have changed and it is time to get the Capri out from her Winter resting place. The car has been wiped down and buffed and looks great in the spring sunshine. With the trickle charger on all over winter she started up after a few turns of the key to get some fuel into the carb. So far so good everything seems to be working fine. I have noticed that one of my headlamp bulbs has blown - I thought it was a bit dark driving home the other night. So I’ve got some on order. The offside repeater isn’t flashing either but this is a regular problem requiring just a bit of cleaning on the contacts. The only other issue I’ve noticed is one of the clock bulbs isn’t working - again this is most likely just a clean up job to get her working again. The Capri has been extensively photographed for the insurance agreed valuation - something I have to do every year. The MOT isn’t due until mid May so now it is just a case of enjoying driving here again. I think I might removed the expansion tank and try to get it clean as it is full of brown stains. Apparently you need some marbles or gravel to swill around and get into all the nooks and crannies. I’ll have to have a think about that.